PAUL BISHOP ~ WRITER: AUDIO BOOK NOW AVAILABLE! Los Angeles 1954. Patrick "Felony" Flynn has been fighting all his life. Learning the "sweet science" from Father Tim the fighting priest at St. Vincent's, the Chicago orphanage where Pat and his older brother Mickey were raised, Pat has battled his way around the world - first with the Navy and now with the Los Angeles Police Department. Legendary LAPD chief William Parker is on a rampage to clean up both the department and the city. His elite crew of detectives known as The Hat Squad is his blunt instrument - dedicated, honest, and fearless. Promotion from patrol to detective is Pat's goal, but he also yearns to be one of the elite - and his fists are going to give him the chance. 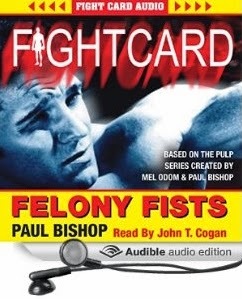 Gangster Mickey Cohen runs LA's rackets, and murderous heavyweight Solomon King is Cohen's key to taking over the fight game. Chief Parker wants Patrick "Felony" Flynn to stop him - a tall order for middleweight ship's champion with no professional record. Leading with his chin, and with his partner, LA's first black detective Tombstone Jones, covering his back, Patrick Flynn and his Felony Fists are about to fight for his future, the future of the department, and the future of Los Angeles.